We're just beginning to get back to our (ab)normal routine after another wonderful CZT training seminar. It's time to catch up on some blog posts. This morning at breakfast, I said to Maria, "Babe, remember that special email we received from Josh? We should do a blog post on that. Let's find some tiles to post with it." 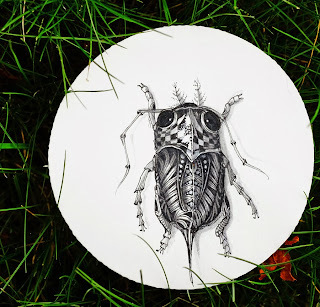 Maria replied, "Laura Harms' challenge this week is all about bugs. How 'bout we post some of my "bug" tiles?" Wow so we used to doodle this stuff late night in a Frisch's Big Boys in high school, and later on after I got out of the service I penned these. My best work was lost in an art book that was destroyed, but these surviving examples showcase this style. I haven't messed with my art in a long time, but now that I see you guys have turned this style into a discipline that can be taught in simple steps, I'm very very anxious to dive back into it again. I realize Zentangle is just a breakdown of how to free flow tribal design, but its so refreshing that someone has finally put it into proper words, and done it in a way that promotes endless creativity. You know, the way it should have been promoted throughout the art world properly for that last thousand years, but only now has finally found voice in your teachings. Thank you so much for writing that and sharing your images. "Yes, there are gifted artists who paint well without lessons, or gifted musicians who can write and play songs without reading music. But they have no method for teaching students their craft. "My father grew up in an Amish home where musical instruments were forbidden. While I was yet in grade school, I would see him bring home from his monthly excursions to the local auction barn keyboard musical instruments: a bellows organ, an upright piano, or several accordions. I would marvel as in a few minutes he could teach himself to play familiar hymns as the family sang along. His method of teaching me to solve any problem was, "If you just look at it long enough, it will come to you." My brain was not wired like his. I never learned to play "by ear." "For certain gifted people no lessons are necessary to create art; not so for the general population. We need a way of learning to make art we enjoy. The Zentangle Method makes that possible for us 'one stroke at a time.'" Our intention is to inspire people to put pen to paper, whether for the first time (because they have come to believe they aren't "artists") or to dust off their pen and get to feel again that thrill of creativity flowing - without preconception or self-criticism. Such a special letter deserves some special companion tiles for this blog post! 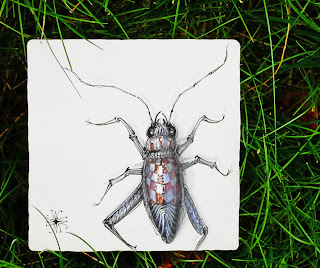 Maria loves to draw bugs. Whenever we encounter an interesting one, I'll take pictures. Or, if it's no longer alive . . . like a great big beetle . . . it finds its way to her desk. 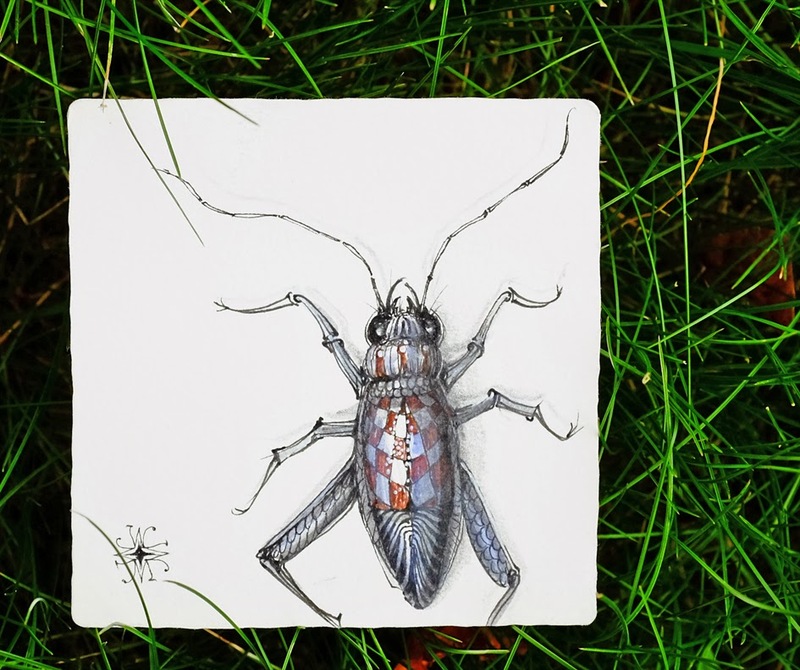 She draws known bugs as well as yet-to-be-discovered bugs. Maria has discovered that when she looks closely, they are all covered in tangles! Congrats to "REI MAR" who was our random chosen commenter on our blog post, "Crack!" Watch your mail box! We welcome and invite your comments. And be sure to go check out Laura Harms' iamthedivaCZT 144th weekly challenge. Maria, I always enjoy seeing your bugs! I love the striking color of the grasshopper on the tan tiles and her fancy high heels sure made me smile! Congrats to both of you on finishing up CZT13! Looking forward to seeing more class pictures and treasures! A grasshopper in heels - fascinating. How refreshing to see someone else who isn't fazed by the arrival of a bug……. my husband - all 6ft 4ins of him will gently poke a speck he sees to ascertain whether it is alive, if so he'll call saying 'there's one of your friends here, can you come & remove it' all the funnier as I'm less than 5ft in height! Love the grasshopper pushing against the edge of the tile. she's intent on something. Great bugs! I especially love the one on the renaissance tile! She really shines! Thank you for sharing your conversation with Josh. I love the way he responce to Zentangle. Will keep his words in mind for the times people ask me how "they from Zentangle think they can trademark this". And as always: wow on the tiles! All tiles are great and I love your bugs; especially the one with high heels. Great!!! Who knew bugs could be so beautiful!! The bugs are so cool. If they really looked like that maybe I wouldn't be so afraid of them! Beautiful as usual. Such an elegant collection of bugs - beautiful! All three bugs are beautiful, but the grasshopper is a real Diva! Maria's bugs are always awesome! Thanks for the inspiration. Love them all, but . . . is that grasshopper coming or going? or both? ha! Would it be possible to see Josh's images? I have to admit that I was intrigued with his letter and am curious about his "take" on the process. I loved reading Josh comments in his letter, he really did capture much of the essence of Zentangle! 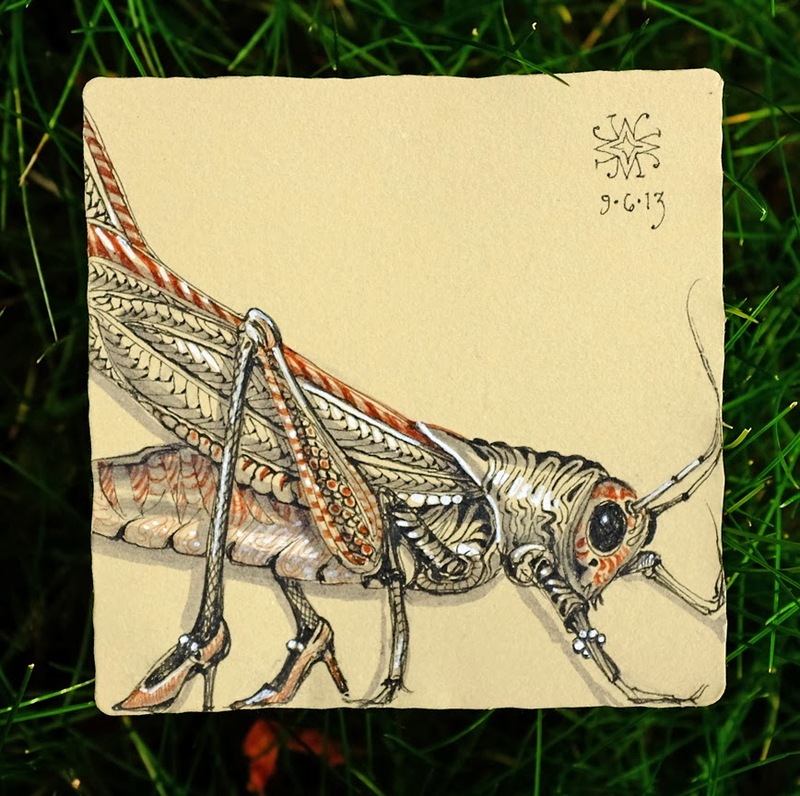 And OMG, those bugs, that Grasshopper on that new Renaissance tile is buggalicious! I love your bugs Maria! So glad you shared them on the diva's challenge! I absolutely LOVE your bugs! Like many other commenters, I especially enjoy the grasshopper in her (?) heels! :) I also enjoyed the letter you shared... I feel so fortunate to have stumbled across your site and communication of this art. Thank you Maria & Rick! I love how varied insects can be in nature, and tangling them only makes them cooler! I may have to have a go at tangling a beetle! I've never thought of bugs being beautiful, but, yours certinaly are! Thanks for more inspiration. Oh, what fun, a bug with heels!! Luvbuggly! that's a great analogy - i love the music one too! thanks! Also, Maria, your grasshopper? i could die. SO lovely. thank you everyone for the kind comments about the darling bugs. I, too, am not that fond of live ones. . . . but love the variations and wildness of these creatures. I am not sure what made me put the red pumps on her, but I love how they compliment her bracelet. . . .
Maria, perhaps Rick had "spiked" your tea. Yes, life is good. I love Josh's comments, and the other comments about music. They're exactly the sort of "ammunition" I like to have when I explain Zentangle. I especially like analogies to music, that's how I came up with the name of my blog, "Tangle Harmony". Below is a comment I left on the Flickr page called Zentangle. I didn't realized until after I had posted that subconsciously you must have crawled your way into my brain with your bugs! Too funny! What's the point of a CZT? I am finding that taking classes with a CZT is hit or miss - and mostly miss. I asked some questions on tanglepatterns.com about learning official patterns and she was pretty rude about it and was like I need to take a class with a CZT. So my first class with a CZT was a zentangle warmup followed by an hour of yoga - which I clearly was not prepared for. And if I wanted to take yoga class I would've signed up for yoga and not Zentangle. So I asked her about more advanced classes and she said that she plans on teaching more meditation/Zentangle classes and maybe a class at an art store in the future. So I bought some online classes - which were nothing different from my Zentangle Kit. Then I contacted a CZT outside my area and she said her classes were pretty much introductory and if I wanted to learn more patterns there are some online and in books. So what is the point of telling people to take a CZT class when they don't really teach anything you can't find elsewhere. And what is the point of them taking the certification class if they are leaving with no idea on how they are going to offer classes that people are interested in? It seems like taking the CZT class is merely a means for someone to learn more of the official patterns, not offer classes to anyone. As with any subject or class, all teachers come with a variety of skills. Some more suited to our own particular needs. When I first learned of Zentangle it was through my sister. She had attended a CZT class and shared what she had learned with me. I then signed up and completed two classes from a local CZT in my area. Being so fascinated with this process I registered for the first available training session with Maria and Rick and attained my CZT Certification. I can tell you my experience. Learning from Maria and Rick gave me the understanding of the process from their perspective. After years of personal experience in the world of art and meditation they developed the process that they now term "Zentangle". They do a marvelous job of training their CZT's to envelop this process and to give them the knowledge to pass it on in a way that hopefully will inspire others and enlist them to incorporate that knowledge in a way that provides personal peace and growth. How well an individual student/teacher receives that knowledge is anybody's guess. So you may be right with your hit or miss assessment. It is my hope that my students come away from my classes with the knowledge and the tools to incorporate Zentangle into their life with the healthy, healing and restorative powers that it has infected (in the best possible meaning) me with so happily. And that Maria and Rick would give me a thumbs up as a representative of their tireless efforts, endless energy and learned knowledge which resulted in "Zentangle". Can you learn to tangle on your own? Yes. Can you learn what Zentangle is on your own? I think it is something from which you must catch "the bug". And if you're going to do that I think your best chance it through a CZT. I have been enjoying each day so far, didn't think I see anything that could beat the beauty on your grasshopper, but then came the 5th day! Each of those tangles are so lovely! My daughter is in art school and she had just talked me into getting some gouache set but I haven't tried them yet. Now I can't wait to give them a try. I only have a starter set but its great to get to see how lovely the results can be with it! Thank you for the insperation! I'm excited to see whats coming up on the other 12 days! Sorry to post off-topic. Could someone please explain how to post comments? I don't know how to decide which "comment as" option is appropriate. (And I'd so love to win a treasure box in the Christmas blog ;). Thank you! Usually I'm freaked out by any kind of bugs but yours look truly amazing! I love every little detail. 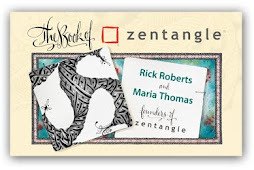 Thank you for inspiring me "one stroke at a time" Zentangle untangles my tangled nerves quickly.Thank you Rick & Maria. They are amazing bugs. did not know that scary insects look so beautiful. need to take a closer look at the the insects in my garden from now on. Your writing taste has surprised me, great reference. Thank you for this post.